Photos from the Dress Rehearsal! Christmas Revels 2000 Program Book Online! The Christmas Revels celebrated its 30th Anniversary by quilting a tapestry of rich American folk traditions ranging from Appalachian to Gospel, and expanding to 18 performances at historic Sanders Theater. For thirty years, Revels has been celebrating the winter solstice at historic Sanders Theatre. Revels audiences have traveled to many unfamiliar lands and times through music, dance and drama. This year's production found Revels back home - in the mountains of Appalachia - as we celebrated the courage of the African Americans who traveled the "Gospel Train," and rejoiced in the simplicity and warmth of an Appalachian Christmas. We hope you joined us on our big front porch and enjoyed the moving harmonies of The Silver Leaf Gospel Singers, a 6-voice a capella gospel choir that's been together for more than fifty years (and who've vowed to keep singing together "until the angels get happy"). And while you're there, stayed a while and listened to the quiet beauty of a Tennessee lullaby sung by 7th generation Appalachian singer and storyteller, Sheila Kay Adams, another of our many featured performers. Also appearing was a wonderful string band, the 40-member Revels Chorus, The Rocky River Children, The Smoky Mountain Dancers, The Cambridge Symphonic Brass Ensemble, and frequent Revels performers Janice Allen and David Coffin. We danced through the grand lobby of Memorial Hall as David led the audience in Revels' signiture piece, "Lord of the Dance," a true ritual of our own. Staged by Revels artistic director Patrick Swanson with music direction by George Emlen, the 30th Anniversary production of The Christmas Revels was filled with rousing Gospel music and soulful Spirituals, Appalachian fiddling and clogging, Shape-Note hymns and Shaker tunes, a breathtaking sword dance and a Mountain Mummers' Play. And, as in every Revels production, audience participation was greatly encouraged! Sanders Theatre is located on the corner of Quincy and Kirkland Streets, a five minute walk from the Harvard Square T stop on the Red Line. Founded in Cambridge, Massachusetts in 1971 by musician John Langstaff and his daughter Carol, The Revels has grown into a national non-profit arts organization, offering a wide Variety of recorded music and theatrical seasonal celebrations using traditional folk materials from around the world. 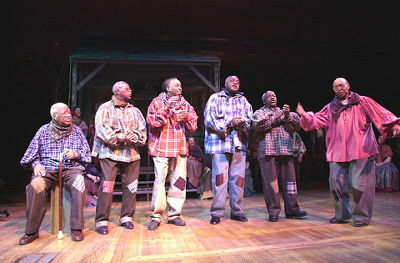 In December 2000, The Christmas Revels: In Celebration of the Winter Solstice will be presented in eleven cities across the country: Cambridge, Massachusets; Chicago, Illinois; Hanover, New Hampshire; New York City; Philadelphia, Pennsylvania; Washington, DC; Houston, Texas; Tacoma, Washington; Portland, Oregon; Oakland, California; and St. Paul, Minnesota. 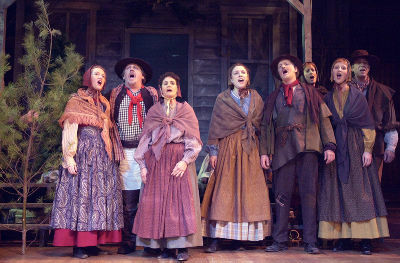 Christmas Revels is supported, in part, by a generous grant from the Massachusetts Cultural Council, a state agency.